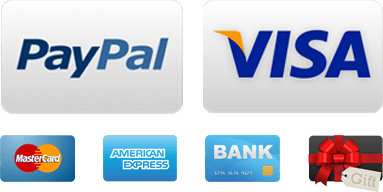 Size 6 / XS Choose from 17 garments. Stunning ivory formal dress / cocktail dress from Adrianna Papell. The dress has beading on a pleated bust and tiered dress. The dress is fully lined and has a back zipper. Black, White and Grey Printed Matte Jersey Cocktail Dress. The dress has a bubble hem and a wide boat neck line. Stunning Red Cocktail Dress / Party Dress from BCBG Max Azria. The dress is ruched pleats throughout, fully lined and has a cut out back. Fuchsia pink cocktail dress / formal dress from David Meister. The pictures do not do justice for this stunning cocktail dress. The dress has a shimmer throughout, beading details at the waist and is fully lined. Gorgeous navy formal dress / cocktail dress with vertical pleats and beaded waist by Adrianna Papell. The dress is fully lined with spaghetti straps. Perfect for summer evenings. 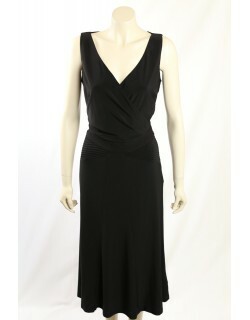 Stunning Black Versatile Dress that can be dressed up for the evening as a formal dress or cocktail dress but also worn as an elegant dress during the day. The dress is in a matt jersey, sits and hangs beautifully and has with detailing at the waist. Stunning Black, White and Grey Printed Matte Jersey Party dress / Cocktail Dress from BCBG Max Azria. The dress has a bubble hem and a wide boat neck line. A pink strapless party dress / cocktail dress from Miss Sixty. The dress is lined and a padded bust with . The dress has a pinkish orange band and detailing. Little black cocktail dress / Formal dress from BCBG with 3/4 Sleeves. Nicely lined this black pearl will impress even the toughest crowd. Be the center of attention in this amazing designer dress. 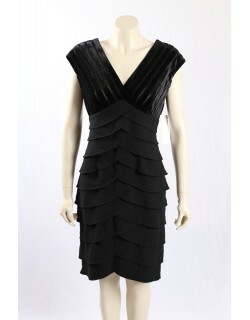 A beautifully designed Black Cocktail dress or formal dress from Adrianna Papell in Velvet shutter pleat. Ivory Gold Metallic Mini Cocktail Dress / Formal dress from AQUA with built in boning in the bust. Simply stunning Gold Shimmer Metallic Formal dress / Cocktail Dress. The dress has cap sleeves, a drop waist and is fully lined. Stunning Black Mesh Sequined One Shoulder Party dress / Cocktail Dress by Jessica Simpson. The dress is fully lined. New Lauren of Ralph Lauren Grey zig zag Sequined Formal dress / Cocktail Dress. The dress is fully lined and is knee length. Dark Navy Knee-Length Casual Dress. The dress has a very slight purple touch to it. The dress is fully lined and has detailing on the shoulder. The dress is missing its accessory belt.